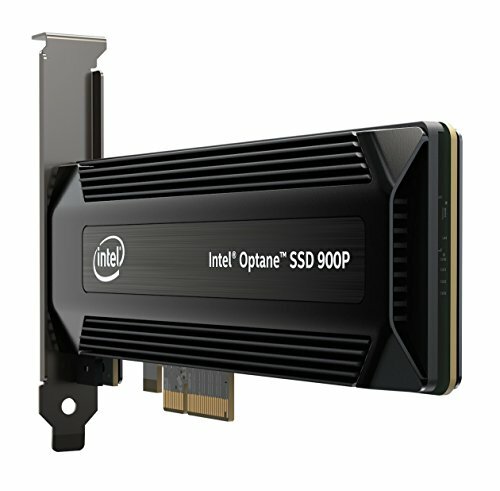 Intel Optane SSD 900P – the fastest SSD for Gaming? Now last year we had a hands-on look at this technology, with these tiny, low capacity models that were designed to make a hard drive that they accompany perform more like a traditional SSD. And it worked pretty well. So since then we’ve been itching to get our hands on one of the full Optane drives that Intel has been promising for years. The Optane 900P is a four lane PCI Express card with an all-metal heatsink and an easily removable backplate that’s full of helpful information about the drive on a sticker. But what’s more interesting is actually what’s underneath. So here we see our first indication that there is more to this card than just a PCI Express to M.2 converter board like you might expect. Then when we flip it over and gently spudge off the heatsink proper, it reveals more of the same. This is absolutely a purpose-built card, and the comparably immense cooler and beefy onboard processor should tell you: This SSD means business. Which is kind of strange considering the Star Citizen promo on the box. Now you can learn more about Optane here. The exact details of Optane’s arrangement are a trade secret, but the end result is a storage latency of a theoretical thousand times faster than traditional NAND, making it only 10 times slower in that sense than DRAM. So while Intel’s rated sequential read and write speeds don’t even get as fast as a fast SSD, like a Samsung 960 Pro, it handles significantly more operations per second, with seven times the write endurance on this consumer product. And a mind-splitting 34 times the write endurance for the datacentre-oriented Optane P4800X, making the finite lifespans of NAND-based products a concern that we can bury in the past. So the high-end video editors and data scientists out there are salivating right now, because this kind of speed and endurance makes these larger drives amazing for use as scratch disks as for what that means for gamers. Well, Intel says that load times will be significantly reduced. Suddenly that Star Citizen promo makes more sense because this game recommends a 200GB SSD. So to test this thing we need a CPU and a platform capable of taking full advantage of it. We chose our X299 bench with a mix of synthetic and real-world benchmarks our SSDs, by the way were, secure erased in preparation for testing. In CrystalDiskMark, we see more or less as advertised speeds across our drives. With Optane scoring quite a bit higher on the 4K randoms at a queue depth of 1 than the others, hinting at its capability for much higher responsiveness. Moving on to performance tests, we can see that Optane managed much more consistent latency that edges closer to, but not quite ramdisk levels of responsiveness. This is super impressive. And it’s at this point then that we wondered whether or not Optane would make a difference for some of the heavy tasks that we deal with around the office, like editing 8K RED video footage in Premiere, or rendering with SolidWorks. But as it turns out – No, it does not. SolidWorks finished its I/O test about 4 seconds faster on Optane, So loading or saving would be your primary benefit here. Unless you run out of RAM during a simulation that could be a very different story. And as for Premiere? Well, In a gigantic surprise to no one it is so poorly optimized for this that when we simulated a low memory situation, with a 24 gig ram drive, It just choked, no matter which drive we had our swap file or the footage on. So then we secured erase the drives again and copy over our Steam library, to see if we could spot any differences in game load times. Which unfortunately, due to the massive install sizes of many modern games, means that we say goodbye to our ramdisk in our testing from here on out rebooting between runs, we ended up with pretty underwhelming results compared to the Samsung 960 Pro. The biggest delta between them was only a little over half a second and even our aging Kingston KC400, an old fashioned SATA SSD really doesn’t do poorly here. Though this is another non-surprise to people who pay closer attention to benchmarks than they do to marketing. One last secure erase and an install of Ubuntu later, our final test is Houdini, a piece of software by SideFX that handles physics simulations for the high-end rendering used by big blockbuster film and game companies. Our test file will be a rendering of a maelstrom that has billion particles interacting with each other. So just one frame is gonna eat our RAM for breakfast, meaning that our ramdisk, again, is not coming back. As for the rest, well, to generate 8 frames our 960 Pro took over an hour of I/O thrashing, while our octane killed it in just under 29 minutes. As for the KC400, we gave it a participation trophy. So then, should you go out and spend $600 on an only 480 gig optane drive? If you’re a normal user, I’m gonna say – No. Because the chances are pretty slim that you would ever notice a difference compared to a traditional NVMe SSD, and even a SATA one is probably fine for you in most cases. As for heavier workloads – Maybe? If you must have the best of the best. But I’m gonna tell you again that you are not going to “feel” a difference, like you did when you went from a HDD to a conventional SSD. It’s not like that. With that said, if you have a real workload that can benefit from Optane’s versatility as not just hyper-fast storage. Like running many virtual machines off of a single drive. But also its low latency and lower cost compared to system memory, where you can use it as an overflow for your RAM like in our Maelstrom demo. While the price of entry is steep, the benefits may just outweigh the costs.